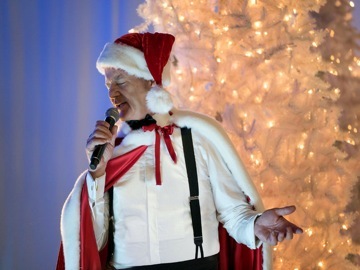 Bill Murray bringing you some Christmas joy, to get you into the season's spirit? Sounds like the most perfect thing in the world and while the movie is far from the perfect, it has some moments of greatness in it, though it's not going to be everybody's cup of tea to watch. It's not really a movie but more of a Christmas special and Netflix exclusive that's under an hour short, in which a bunch of celebrities show up, starring either as themselves or some unnamed characters, that aren't all that relevant to the 'story' or point of the movie though. It's not necessarily the characters are all redundant ones in this movie but more because it's not really following much of a story in the first place. This both is a good and a bad thing. For the first half Bill Murray is mostly trying to avoid everything Christmas related, as a sort of grumpy old Scrooge (ironaicaly Murray already played a modern Scrooge character in the 1988 movie "Scrooged"), while in the second half he's constantly busy getting everybody, including some complete strangers for him, into the Christmas spirit. It isn't making much sense once you really start thinking about it but it's the perfect opportunity for Bill Murray to show two different sides of himself, that he both handles very well. Of course he's perfect as the grumpy and complaining celebrity, while later on he's also given the opportunity to show some of his other comedic talents when he's interacting some more with other actors and the movie isn't so much just the 'Bill Murray show' anymore. It's obvious that for most part of the movie, especially its first half, all of the actors are ad-libbing, while still following certain plot-points. This is when Bill Murray is at his best and most fun to watch, while all of the other actors are also doing a pretty decent job with it. This also is when the movie is the best and most fun to watch, while certain of its plot-points feel forced and not needed at all. It's as if they gave the director and actors a few pages of script, telling them they should improvise everything else around it on the spot, while on set. This works well for its comedy at times but it's a bit of a killer for its flow and the fragile storyline that it's trying to follow. Both Bill Murray and director Sofia Coppola probably felt comfortably doing this, since they pretty much did the same thing before 12 years ago when making "Lost in Translation" but perhaps it's the sort of thing that simply just works better for a full length movie rather than a short because of the simple reason that in a full length movie you have far more time and room to play around and to improvise certain scenes, while still be able to follow a tight script at the very same time. Thing I personally also wasn't too fond of were the many, many different songs. I mean, the singing-acting ratio in this movie has to be somewhere around 80%-20%. It's just a bit too much for my taste and it's even somewhat annoying how toward the end every song gets followed by 15 seconds of dialog before the next song kicks in again. Sure, it's all still fun and good at times and it will certainly put some people into the Christmas spirit but it's just that I was liking the movie so much better when it was just Bill Murray and friends, dialog, improvisation and fun random cameos. It's all good and fun to watch if you're a fan of Bill Murray and like to see actors fool around and ad-lib together but is it a perfect comedy or the ultimate Christmas special that's going to put you into the holiday spirit and one that you can watch year, after year, after year? In my opinion it's really not. It's fun to watch once and it's definitely also a good short to watch but I doubt I'll be ever seeing it again, or will be singing any Christmas songs for the next fews days. Ohh and for those worrying; Yes, Miley Cyrus is in the movie but she actually is one of the highlights in it, surprisingly enough!